The upturned telescope was designed by the architect Robert Burn, and was built between 1807 and 1815. In 1853, a large time ball was introduced, which is lowered as the one o'clock gun is fired from Edinburgh castle each day. 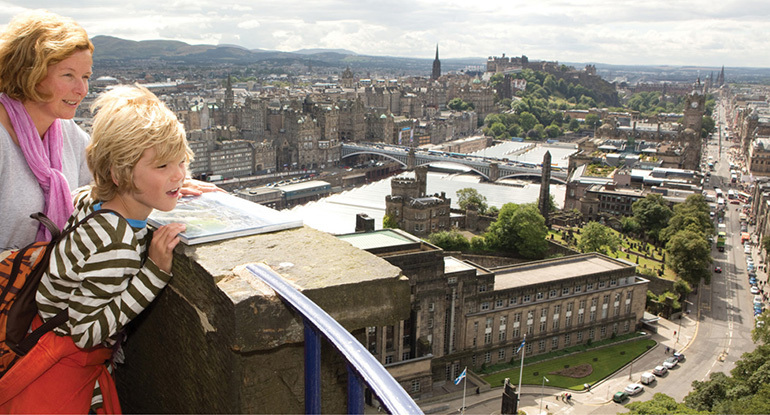 Climb this monument for stunning views over the city! £6 entry to climb the tower, but the museum on the ground floor is free (although donations are always welcome). Footpaths lead up Calton Hill from both the south and east. At the east, the path from Royal Terrace starts close to Greenside Church. On the south side, steps lead up from the junction of Waterloo Place and Regent Road, and a pedestrianised gated roadway (disabled access by arrangement) from close to the Old Royal High School, Regent Road. Cycle access is from the east of Calton Hill via Royal Terrace close to Greenside Church. From the south side at the junction of Waterloo Place and Regent Road access here is via many steps so bicycles would need to be carried up, or locked at the bottom. Leave Waverley Station by the Princes Street exit; look right (east) on Princes Street and you can see the monument. To reach it, walk east, carry on due east down Waterloo Place, cross the road to find the steps up the hill, or carry on another 250 yards east to reach the pedestrian gated roadway. Many city bus routes pass by or close to the East end of Princes Street. There is general metered parking close to the South and East access to the hill, and disabled parking by arrangement at the top of the hill. The main entrance has 2 steps. There is lo lift and no ramp. We have display information in braille and large print. Visit guides are translated in German, French and Spanish. For anyone visiting the Nelson Monument, they will first and foremost want to see the spectacular views from the elevated platform. The platform affords some of the finest panoramic prospects of the city, and on a clear day it is possible to see the new Queensferry Crossing spanning the Forth estuary to the west, and Berwick Law and the Bass Rock to the east. The Kingdom of Fife stretches out to the north, and the Pentland Hills and Scottish Borders to the south. However, the views are not the only reason to visit. Inside the base of the monument are a series of museum displays. 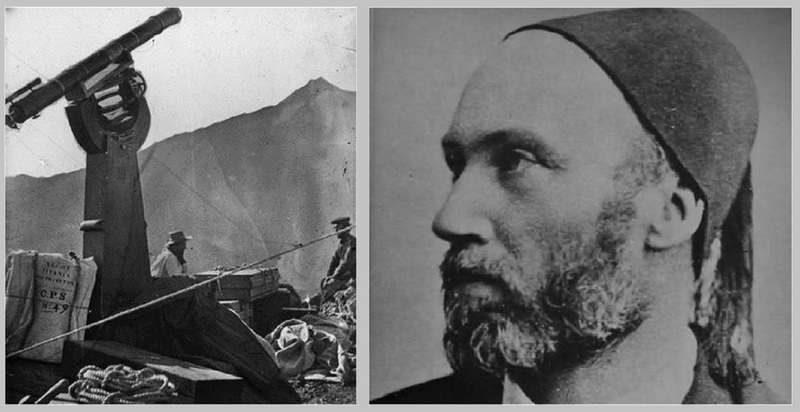 Our current exhibition explores the life of Charles Piazzi Smyth, photographic and spectrographic pioneer, inventor of mountain top astronomy, popular author, Egyptologist and originator of the One O’Clock Gun and Time Ball. 2019 marks the bicentenary of the birth of Piazzi Smyth. This special exhibition presents the story of this extraordinary man, whose pioneering work at Calton Hill changed the practice of astronomy across the world. A life size carved wooden figure of a sailor using a sextant, from the 19th century, is one of the star objects on view. Other displays investigate the importance of Scotland’s Merchant Navy, as well as the ongoing work of the Northern Lighthouse Board. Download our comprehensive access guide to find out how you can get to and around the Nelson Monument.